We’re really, really excited to finally share what we’ve been working on the past few months! We’re calling it Judson​direct. If you're already interested, sign up for early access on our waiting list. Judson​direct is our answer to the question “How can we help Judson & Co. customers sell online?” We’ve taken our inventory, fulfillment, and payment processing technology and made it all accessible to our customers, with only a few clicks. You simply select the items from our inventory you’d like to sell, and an online store is automatically created, just for you. You can promote that store on your Facebook, Twitter, Instagram or Pinterest (and many other places) and begin selling online in seconds. So, what does the whole process look like? When your customer places an order from your direct store, we process their payment for you, and utilize our finely tuned fulfillment process to pick, pack, and ship the order, directly to their door. Deposits are made to your bank account every two days. We always stay 100% invisible to your customers, and you keep 70% of the profit. It’s really that simple! No monthly fees, no contracts. You can find out more information about Judson​direct on our waiting list page. We’re granting access to new customers each day. You’ll receive an email when your access has been enabled. To learn about new product announcements first, you should follow us on Twitter, and like us on Facebook. We’ve been having so much fun around the office making collections that celebrate the season (and even some that remind us of the season). From 80s Chic to Glitz and Glam we’ve really been expressing ourselves, and now it’s your turn to have some fun! Today, we’re excited to roll out the ability to create collections to all of our customers! Whether you’re putting together lots of styles to create awesome new looks, or you’re just organizing your ideas by outfit — Collections are a fun and awesome way to curate and refine your ideas as you shop! 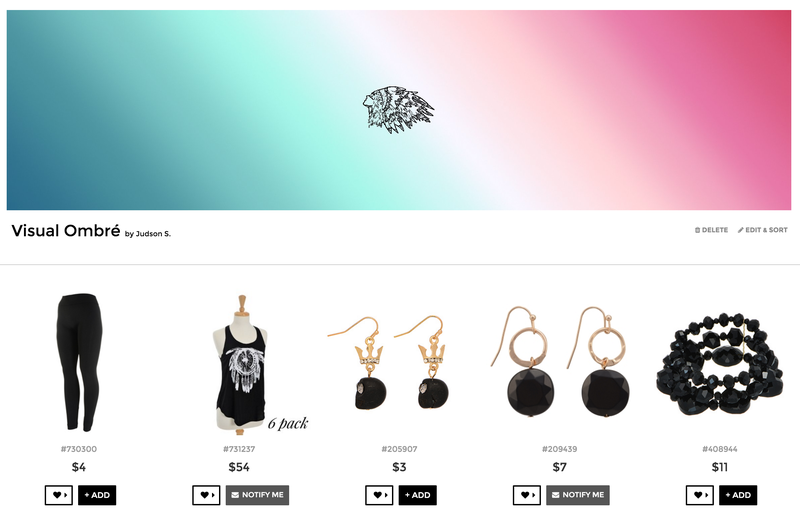 Starting today, you will see a new heart button on the category and product pages. You may collect products, and create new collections right from the dropdown menu that appears. The heart icon in the menubar now takes you to view all of your collections, as well as create a new collection. You’ll also now see your saved items in a special “Saved For Later” collection. Who can see my collections? By default, your collections are public and may be featured, or shared with others on the site. If you’d rather your collections not be featured, simply mark them as “private”, when editing your collection from the collection page. How can I get my collection featured? We like to think of ourselves as an editor of the featured section. For now, we feature public collections we find unique, creative, and beautiful. If you’ve got a collection that you want featured, drop us a line. There are so many products to explore and curate. We hope our new collections allow you get creative!. Make outfits and looks. Add header images, and show off your style. Collections have made it easier for us to refine our shopping ideas, and we know you’re going to love them. It’s been amazing to see so many of you checking out our curated collections! From awesome greek life accessories, to artsy blue hues, and ‘Hope’ inspired pink — there are lots of collections to keep up with, but no way to know when your favorites are growing. 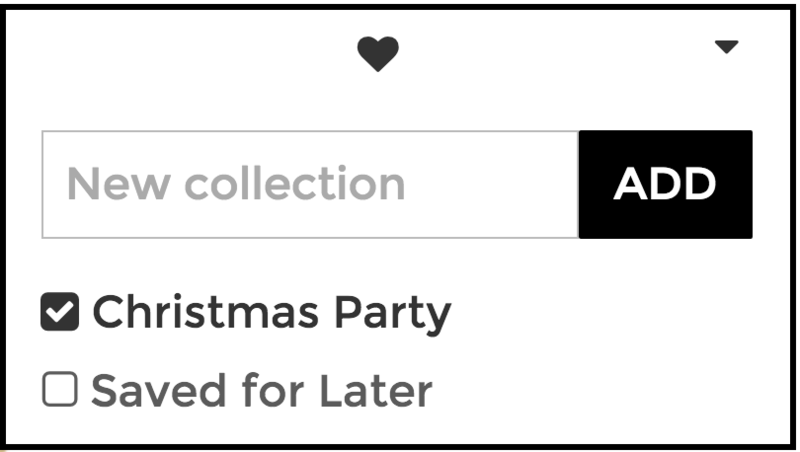 Today, we’re excited to introduce Collection Following, a new way to keep track of your favorite collections, and show the curator some love. Following a collection is your way of telling the curator that you like what you see, and want more items added! As items are added, you will receive notifications in your notification center. How do I follow a collection? Following a collection is easy! While viewing a collection, simply click the “Follow” button to the right of the collection name. You’ll be able to keep tabs on the collection, and the curator will appreciate the love. How do I see the collections I’m following? We’re so excited to show this to you, and we can’t wait for you to try it out! How about following along with some Visual Ombré or other collections that may fit your style? With the successful launch of Featured Collections, many are seeing products mixed-and-matched in ways they hadn’t imagined — and it’s making these items very hard to keep in stock! Elizabeth’s (very trendy) “Trendsetter” collection displays this effect perfectly. This is why we are excited to introduce Product Notifications, a super simple way to be alerted when products you love are available for purchase again. How do I use Product Notifications? When you find a product that you love, but there’s no stock, simply click the ‘Notify Me’ button, and the product will be added to your ‘Saved for Later’ collection. When the item returns to stock and is available for purchase, we’ll send you an email to let you know! It’s that simple. What if I am not longer interested in a product? To unsubscribe from a product notification, simply remove the product from your ‘Saved for Later’ collection. You will no longer recieve emails when the removed product is back in stock. Everyone has been having a bit of fun around the office the past few weeks, and we’re really excited to show off what we’ve been working on — Curated Collections. We’ve already made it easy to browse our selection of products by extensively categorizing each piece in our warehouse, sorting by our trending algorithm to find products ‘trending right now’, and the introduction of Profit Stars makes finding high profit margin items a breeze. Curated Collections make it easy to shop by taste and follow styles and trends hand picked by staff curators. Caitlin’s collections show off fall trends, awesome plaids and her love of University of Alabama football. Elizabeth put together an old school elegance inspired This is why I dress up collection, and Christy has been hard at work with bee inspired accessories, her take on fall, and even a funky goth-inspired collection. We think of our collections as standalone pieces of our diverse taste and style — (Visual Ombré anyone?) and we know that you’re going to love them. View all of our curated collections! Sometimes there are just too many amazing new products to purchase them all at once. Until now, remembering to add those products to your next order involved taking mental notes, or covering your office walls in Post-Its. Today, we are happy to announce a new feature that we know you’ll love: Save For Later. Your Save For Later is a collection of awesome products that you’d like to revisit at a later date. Maybe you’d like to show your business partner, seek opinions on your companies Facebook page, or remember those products that you frequently order — We’re sure you’ll find many reasons to save products for later. On product pages and in the product modal, you’ll find a new button titled Save For Later (or “Saved For Later” if a product is already saved). A simple tap, and the product is saved. Viewing your saved products as easy as tapping the heart that appears beside the My Account link in the header. The number of saved products is displayed to the immediate right of the heart. With hundreds of new products being added to our online catalog every week, sometimes really great products get lost in the crowd. To counter this, we’re excited to announce a new way to find products you’ll love — Profit Stars. We’ve curated over 300 amazing products that just need a little love, given them an additional discount (between 5% and 30%), and made them super easy to find. Products may have up to three profit stars (★★★) based on their potential profit margin, with more stars meaning better potential margins. Finding Profit Stars is easy! When browsing categories, look for the new ‘sort’ option titled “Profit Stars ★”. What are you waiting for? Check out some Profit Stars in our fashion jewelry section.